When you want to visit Kharkov we are here to provide all the support to make your visit an easy and pleasant one. 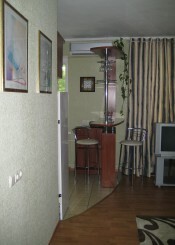 We can offer you a range of nice apartment in Kharkov for daily rent. 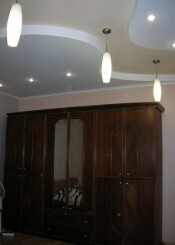 It doesnot matter if you want to rent apartment for one night or for a few weeks we will be glad to help you. All our apartments are situated in safe and secure regions of Kharkov center, have all necessary appliances for comfortable accomodation in Kharkov. 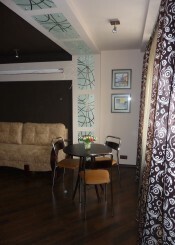 Our rental prices and really nice locations in the center of the city are grate alternative to more expensive and less convenient hotel accommodations in Kharkov. 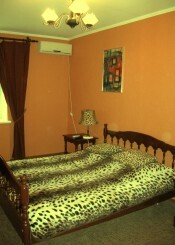 We can arrange for just about anything you need to make your stay comfortable and worry free. If you require breakfast, housekeeping, shopping assistance, laundry then we can usually arrange this for you for an additional cost provided we are given enough advance notice. You can use Internet in any chosen apartment. We will be glad to provide you with USB-modem for Internet acsess. With USB modem service you are not tied on yor working place and you can moove around the city, your Intenet connection is not interrupted. You can use it for work or entertaiment. With the help of our service your working place can be really mobile. Price Eur 2 per day. Equipment: UCB-modem Standart:CDMA 2000 1хEVDO, Rev. A, connect to USB-in directly. An average speed is from 200 to 800 kilobits per second. The maximum speed of incoming traffic is 3.1 megabits per second. Cancelation policy: Cancelation made 30 days before arrival - 100% refund of your deposit, 3 weeks before arrival - 50% of your deposit, 14 days before arrival 0% of your deposit. When you plan to visit Kharkov, please, contact us in advance. We will offer you available apartment for the best price and quality you are looking for. 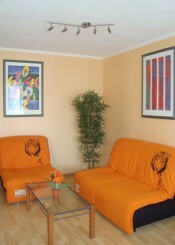 Apartment is located in the center of the city, near the Central Square. A nice and clean apartment includes a studio with kitchen and bathroom. Complete renovation made in 2009. It has pleasant interior, new modern lightening, furniture and amenities. Secure entrance door (combination lock), gas water heating system, shower cabin, washing machine, microvawe, satellite TV, CD, DVD player, big wardrobe, iron, microclimate system (air conditioner + air heater). The kitchen area includes a fridge, microwave, stove, and other basic kitchen necessities. There are shops, travel agencies, restaurants, cafes, banks near by. Nice, modern, two-rooms studio apartment. Renovation 2010. It is situated in the central part of a city, next to the underground of 23-August. Beautiful view on Lenin's prospectus opens from loggia. The living room includes the sofa bed, a dining table with chairs. The bedroom has a king size bed, coach can be transferred into an additional sleeping place. Gas hot water system and independent heating system, local phone number, air conditioner, TV, DVD, CD's/type recorder , shower cabin, ironing set, fridge, stove, and so on. The beautiful and modern furniture. There is supermarket Billa, the banks, restaurants, market, parking, Night club and bowling, Ukrainian restaurant "Large village" next to apartment. Apartment is located next to the center of the city. A nice apartment has 3 rooms, kitchen and bathroom. It has pleasant interior. Secure entrance door, gas water heating system, gidro masqage shower cabin, washing machine, satellite TV, CD player, microclimate system (air conditioner + air heater), phone. The kitchen area includes a fridge, microwave, stove, and other basic kitchen necessities.. This apartment is well appointed and functional, with good quality and newer furnishings to ensure a pleasant stay in the center of the city (10 minutes from main square). New design of 2010. Coach can be transferred into an additional sleeping place. Gas hot water system and independent heating system, local phone number, air conditioner, TV, DVD, CD's/type recorder , shower cabin, ironing set, fridge, stove, and so on. Apartment is for 1-2 persons.